Three generations, two centuries remixed, one dysfunctional family. Washed-up history professor Lewis Birch (Oscar and Emmy nominated Griffin Dunne) takes his begrudging teenage kids – Zoe (Madeleine Martin, “Californication”) and Jack (Devon Graye, “American Horror Stories”) – on a road trip to a conference in hopes of putting his career back on track. But, when Lewis’s estranged father Stanley (Emmy Award-winning Stuart Margolin) goes AWOL on a Lewis and Clark historical reenactment trek, Lewis is forced to make a family detour. The Birch family find themselves on a journey of discovery and connection as they make their own passage west. THE DISCOVERERS is a bittersweet comedy and moving debut feature from writer/director Justin Schwarz led by Dunne’s striking comeback performance. This engaging tale of family dysfunction and rediscovery also features a talented ensemble cast including David Rasche, (IN THE LOOP), Dreama Walker (COMPLIANCE), Ann Dowd (COMPLIANCE), Cara Buono (“Mad Men”), Becky Ann Baker (“Girls”), Scott Adsit (“30 Rock”), and John C. McGinley (“Scrubs”). 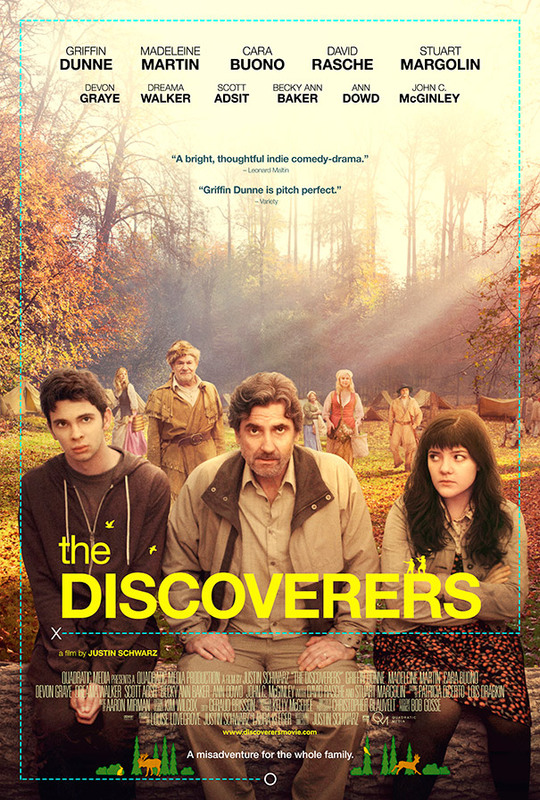 The Discoverers creative team includes cinematographer Chris Blauvelt (Bling Ring), production designer Kelly McGehee (What Maisie Knew), editor Geraud Brisson (Big Sur), and Oscar-nominated sound designer Ron Bochar (Moneyball). © 2014 The Discoverers Movie LLC. All rights reserved.